I finished Naomi Novick’s Spinning Silver this evening and Sherry Thomas’ A Conspiracy in Belgravia last night and have a couple audiobooks I’m waiting to come back around to me. That means I have the options you see above — including The Poet X by local author Elizabeth Acevedo, which was longlisted for a National Book Award last week — to start immediately. (Rudi would point out the pile of other library books around the house as a sign that I have more books than just these to choose from.) I’ll also probably start my illustrated copy of Harry Potter and the Chamber of Secrets, because I like to visit with old friends, as well as make new ones. As I type, I’m downloading the audiobook of Crazy Rich Asians, so I can compare the source material to the film, which Rudi and I really liked. On the knitting front, I have not yet finished my shawl, but I continue to plug away at it a couple of rows at a time. Hopefully, I’ll be able to finish it up next week, since fall arrives this weekend! To celebrate (and because I had a lot of work meetings this week, I started a new pair of Knitterly Things socks in Hocus Pocus. Clearly it would be awesome to have them to wear next month. Holiday knitting should commence immediately, which means I should decide what I’m going to make, if anything. 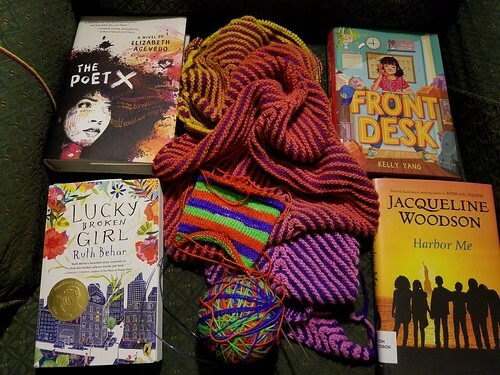 As Kat Knits has a linkup to other posts about knitting and reading, so head over there to check them out.